Students learn the basic economic concept of opportunity cost and draw a production possibilities frontier to learn the constraints a society faces when deciding what to produce. After reviewing opportunity cost, students learn that the math concept of slope can be used to model the opportunity cost of a production possibilities frontier. They practice computing slope on simple, linear production possibilities frontiers before examining the more realistic concave production possibilities model. Students end the lesson by speculating why the opportunity cost of producing goods changes at various points along the production possibilities frontier. Define slope and opportunity cost. Compute the slope between two points. Use slope to interpret opportunity cost. Which of these best describes the concept of slope? An expression of the curvature of a line. A function of two variables used to solve inequalities. An algebraic notation of absolute value. Barney and his friends enjoy doing two things: painting pictures and writing poetry. However, they must allocate their time. If they are doing one activity, they cannot be doing the other. Barney and his friends have the following points on their production possibilities frontier (the first number represents the number of pictures painted, the second the number of poems written): (5, 15) and (3, 29). Which of these expresses Barney’s opportunity cost? Give up 1 painting to write 5 poems. Give up 1 poem to paint 2 pictures. Give up 1 poem to paint 4 pictures. At a given Point A on the production possibilities frontier, Atlantis has a slope of -1/3 between Good X and Good Y. 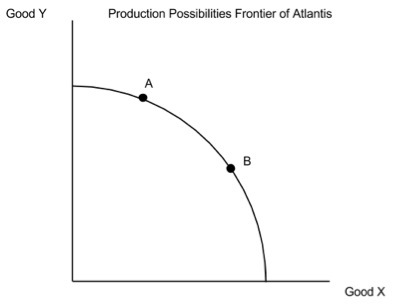 At Point B on the production possibilities frontier, Atlantis has a slope of -1. Assuming we are moving production from Point A to Point B, which of the following best describes the opportunity cost of choosing more of Good X? The opportunity cost is decreasing. The opportunity cost is constant. The opportunity cost is positive. Imagine you are the Chief Production Officer at a factory which can make two toys: plastic dolls and teddy bears. You have been given the task by the owner of the factory to model the use of inputs in producing both products. Assume that the same resources can be used to make teddy bears or plastic dolls. If you put all available resources into making plastic dolls, you can manufacture 160. If you focus only on making teddy bears, you can manufacture 20. Draw a linear production possibilities frontier and calculate the slope. Using your data from part a, give any two combinations of plastic dolls and teddy bears which would also be feasible to produce. Explain why the production possibilities frontier between plastic dolls and teddy bears is not likely to be linear. Ask students to define slope and opportunity cost. Refer students to Slide 1 and review the computation of slope, specifying the “rise over run” calculation. Conclude the lesson by asking students to state the relationship between slope and opportunity cost. The concept of opportunity cost is a foundation of economic study, and while advanced mathematics is generally used to compute it from a production possibilities frontier, the computation of slope (“rise over run”) can be used to approximate the opportunity cost by using production possibilities curves. Students will be using their math skills to compute the slopes of various production possibilities frontiers in order to determine the opportunity cost of producing different combinations of two goods. Ultimately, students will move from computing slope on a linear production possibilities frontier to one that is concave to the origin where the slope changes. This lesson is best taught in a high school Introductory Algebra course. The teacher should note that this lesson does not cover all aspects of slope. For example, all of the slopes examined in this lesson, due to the nature of the production possibilities frontier, are negative. Further, the slopes are located exclusively in the first quadrant of the coordinate plane. However, the lesson is designed to teach students a practical application of slope. Begin class by asking students how they choose to allocate their time after school. Explain that students have a constraint—the amount of time available after school and before they must go to bed. If they spend that time doing one thing, they can’t spend it doing something else. Point out that if you spend your time after school grading papers, you can’t spend your time at the gym—going to the gym is your opportunity cost. Ask a student how s/he would spend an hour after school and what the opportunity cost of that hour would be. Display Slide 1 for the students. Explain that economists use a model called a production possibilities frontier. Define production possibilities frontier as a graph showing the combination of two goods, which can be produced given current resources and technology. Explain that the production possibilities frontier is a model with the following assumptions: an economy is producing only two goods, the amount of resources available (labor, capital, and natural resources) remain constant, and technology remains constant. Using Slide 1 as a guide, walk students through the key components of a production possibilities frontier. The two endpoints on the axes indicate the points where the producer is making all of one good and none of the other. For example, this producer can make 60 chips and zero fish or 30 fish and zero chips. Any point along the curve is a combination of fish and chips which this producer can make given current technology and resources. What is happening at each of the endpoints of the line? What is happening at any point along the line? What is one possible combination of cars and trucks that Utopia can produce in each graph (1 through 4)? What assumptions are we making about technology and resources in Utopia? Point out that points outside the frontier cannot be reached with current technology, while points inside the frontier can be produced but some resources are not being used—that is there is unemployment (people aren’t working, factories are empty) or inefficiency (points along the curve represent technological efficiency). If technology improves, production can occur outside the production possibility curve. Show Slides 2 through 6 and explain the definition of slope with the formula vertical change/horizontal change, often referred to as “rise over run.” Explain to students that slope measures the steepness, or rate of change, of the line. Use Slide 3 to demonstrate the mathematical computation of slope. The “rise over run” expression is a simple and direct way to teach the concept. Use Slide 4 to explain that slope measures the rate of change from one point to the next. This concept will be important throughout the lesson, as students use the production possibilities frontier model. Use Slides 5 through 7 to guide students through the mathematics. Show Slide 8 and have students practice slope problems independently. Circulate around the room to check student responses to these questions. Explain that slope is related to an important concept in economics called opportunity cost. Explain that opportunity cost is the value of the next best alternative given up when a decision is made. Using the production possibilities frontier from Slide 1, show that as more chips are produced, a certain number of fish must be given up. Conversely, as more fish are produced, some chips are given up. Reinforce that the exact amount of one good sacrificed to gain the other is the opportunity cost, and is represented by the slope of the line. Explain that students will be using slope to identify opportunity cost. Distribute a copy of Activity 2 to each student. Have students complete the activity. Review student answers. In Graph 1, what is the opportunity cost of producing 20 trains? In Graph 1, what do you notice about the relationship between the number of trains given up and the number of airplanes gained? In Graph 1, what is the relationship between slope and opportunity cost? Review with students the answers to Graphs 2 and 3, asking the same questions (a-d) with each graph. Distribute a copy of Activity 3 to ¼ of the students, Activity 4 to ¼ of the students, Activity 5 to ¼ of the students, and Activity 6 to ¼ of the students. Give students time to compute the slope of their respective section of the production possibilities frontier. How is the shape of this production possibilities frontier different than the previous ones? What is the slope of each section of the graph? What do you notice about the various slopes of each section? What does this indicate about opportunity cost? Explain to students that real production possibilities frontiers are rarely straight lines, and tend to resemble the bowed out ones they have just completed with changing opportunity cost. Ask students to speculate why the opportunity cost between producing radios and producing TVs could change. Explain that as we make more televisions the tools we are using to make radios are not quite as efficient as they were, increasing our opportunity cost; essentially, we have to give up more of radios to gain fewer televisions. Project interactives.councilforeconed.org/activity/ppf/ onto the screen. To check for understanding, ask students to drag and drop the correct slope onto the proper section of the production possibilities frontier. If the slope is correct, it will remain in place. If it is not, the slope will return to its original location. As students complete this activity, remind students why the slopes change and why they increase or decrease based on the location of the slope on the curve. Remind students that the efficiency of resources is changing, and that the resources used to manufacture chalk are not as efficient at making erasers. Thus, the opportunity cost increases as we make more chalk and fewer erasers.